Left to right: Susan Lovelace, LRJF Board Member; Sebastian River High School Students Ruth Philippe, James LaBranche, and Lucille Stull; Jaime Sturgeon, IB Coordinator at Sebastian River High School. 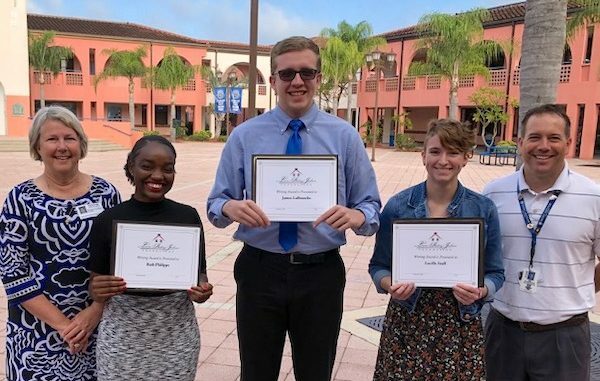 SEBASTIAN – The Sebastian River High School English Facility selected three seniors who have demonstrated excellence in writing in their high school courses. The Laura (Riding) Jackson Foundation (LRJF) has given a $300 writing prize to local high schools for the past several years. The foundation lets the school decide how to apply the award money to celebrate outstanding writing, which is part of the LRJF mission to encourage young writers. Congratulations to students Ruth Philippe, James LaBranche and Lucille Stull who each have been awarded $100 on behalf of the Laura (Riding) Jackson Foundation.